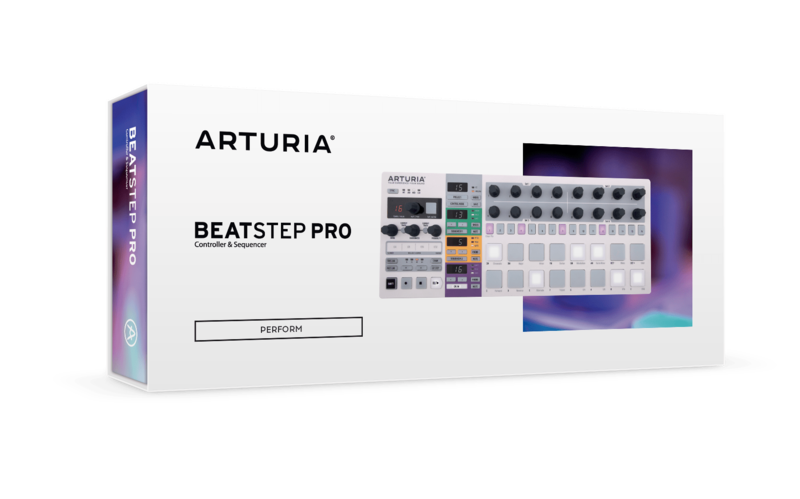 Home › Arturia Beatstep Pro CLEARANCE SALE!! 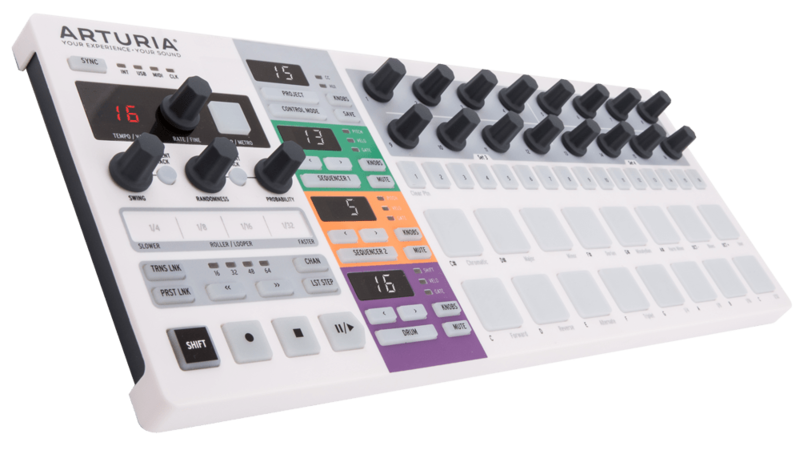 Arturia Beatstep Pro CLEARANCE SALE!! Once in a great while a product comes along that is so incredibly useful, so brilliantly simple that it fills a musical gap like nothing before it. BeatStep Pro fits that description perfectly. It offers an astounding array of control options, sequencing capabilities and potential connections, and whether your setup is all analog, all digital, or any blend of the two, it will gravitate to the center of everything you do and stay there. BeatStep Pro: As unique as the music you will make with it. BeatStep Pro thrives at the center of a diverse, powerful system. We designed it to be compatible with almost any hardware or computer-based device you might want to use with it. USB and MIDI in/out ports establish two-way communication between the digital and analog worlds. Control, sequence, and synchronize other equipment, courtesy of BeatStep Pro. The melodic sequencers provide three 1/8" jack connectors each: Two CV outputs for Pitch and Velocity and one for a Gate output. You can also take advantage of your favorite drum sounds using MIDI or the eight drum gate outputs. Sync a vintage drum machine, or trigger its sounds with the patterns you create with the BeatStep Pro! And all the while the BeatStep Pro will keep the system in perfect sync. BeatStep Pro will supercharge your creative process at the show or studio. Two independent step sequencers and a separate drum sequencer make it a highly versatile, instantly variable creative tool. As a MIDI controller it has enough customizable knobs, pads, and transport controls to drive your music where you want it to go. And with an unprecedented diversity of connections it provides the missing link between technology that was, is, and is to come. Send MIDI Machine Control messages to start and stop your favorite DAW. Use Record mode to enter sequences or drum patterns in real time. Link your sequence preset or transposition changes so all sequencers change at the same time. Set swing amount per sequencer or globally. Add subtle or wild amounts of pattern unpredictability with the Randomness and Probability controls. Displays the Tempo or the selected parameter value, which may be edited by the encoder. Tap a tempo or enable/disable the metronome with the gray button. Select the internal clock or slave to a DAW, external MIDI clock, or analog/DIN sync. Select sequences independently, set the Knobs mode for each sequencer, and mute or unmute sequences. Choose one of the 16 Projects or enter Control mode from here. Touch a knob to see its value in the display without editing it, then use the knobs to edit the pitch, gate, velocity values and timing shifts per step. The 16 Step buttons enable and disable the steps in the current sequencer during playback. They also can be used to select the current sequencer’s preset. The 16 highly responsive pads allow you to play sounds either in Control mode or Drum mode. They are also great for playing notes into the melodic sequencers and transposing the sequences during playback.. The 1 volt/octave CV/Gate outputs and the VELO output give each sequencer three ways to control a modular synth or our MiniBrute/MicroBrute analog synthesizers. External devices can be triggered by Pads 1-8 and the drum sequencer using the Drum gate outputs. Send or receive standard square wave clocking signals by way of the Clock connectors. Use one of the included MIDI adaptors and BeatStep Pro will send or receive DIN sync with stop/start messages. BeatStep Pro will interface with any MIDI equipped gear using the included MIDI adaptors. The USB port allows for standard class-compliant bus-powered operation. Use a USB power adaptor to run BeatStep Pro in a standalone situation.